WE ARE NOT CLOSED. WE JUST DISAPPEARED OFF OF GOOGLE THIS WEEK. Utah bankruptcy attorney Robert S. Payne files Chapter 7 and Chapter 13 bankruptcy to stop garnishment, foreclosure, and collections. Robert has filed well over 2,600 bankruptcy cases in Utah in the past 12 years. We offer free telephone consultations. (If you'd like to know why the website is so awful, go here). 01/16/2018 We have 51 5 star reviews on our main Google page. 04/26/2018 We have over 100,00 views on our bankruptcy blog. 01/09/2018 Feedspot.com named us one of the top 100 bankruptcy blogs. 08/29/2016...We have over 50,000 views on our bankruptcy blog. 05/09/2016...We passed the 2,000 cases-filed mark. 12/01/2015...We have 27 5 Star reviews on our main Google page. 08/24/2015... We have hit 20,000 views on our Utah bankruptcy blog. 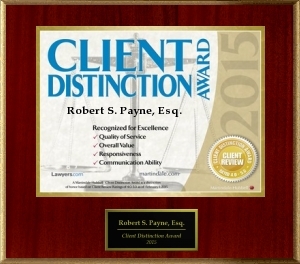 02/20/2015... We received a Lawyer.com/Martindale-Hubbell award for positive client reviews (less than 1% of 900,000+ attorneys receive this per year). 08/07/2014...We were nominated for an AIOBA (American Institute of Bankruptcy Attorneys) award for being one of the 10 best bankruptcy attorneys in Utah here. You can find our News Archive here. See our "Frequently Asked Questions" page for a list of blog entries.